Texas Alcoholic Beverage Commission(TABC) requires that all retailers of alcohol have a license or permit in order to sell in Texas. The license or permit must be valid and can only be acquired through the TABC. It is also recommended (but not required) by the TABC, that servers of alcohol acquire a TABC approved Responsible Serving® certificate. To receive this certificate servers would have to take a course that covers the Responsible Serving® of Alcohol. How do I get a TABC certificate for serving alcohol responsibly? Where do I go to take this course? You're in the right place! For a limited time, you can get your TABC approved wallet card online for only $8.99! Receive your official TABC plastic wallet card in the mail for NO EXTRA CHARGE! 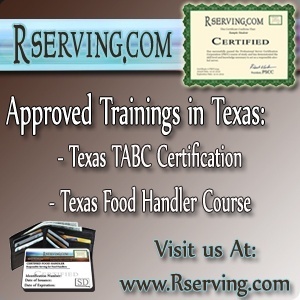 Texas TABC Certification for your entire staff. Are you an employer, and would you like to get your entire staff certified in alcohol serving (TABC certification)? We also offer a FREE Employer Account from PSCC to help you get your entire staff of alcohol sellers/servers certified. The FREE Employer Account will allow you to monitor the progress of your employees as they move through the TABC certification course (Texas Responsible Serving®). Once they successfully complete the TABC certification course, you can print or archive their TABC certificates. Click Here to find out more.